Overseas immigration has been the most preferred option for the skilled professionals to raise their lifestyle, standards of living, and quality of life in quick time. The countries like USA, UK, Germany, Australia, Canada, etc. have been providing a safe haven to the immigrants since long. However, in last few years, the top immigration destinations have started controlling the number of immigrants in their respective countries due to various reasons. The global threats like terrorism, etc. have been few of the key reasons behind this. Visa frauds or illegal immigration, etc. also contributed to the cause to a great extent. Well, whatever the reasons may be, the truth is the immigration and visa policies of most advanced nations are now not lenient the way it used to be a few years back. The permanent residency (PR) Visa provides the right and privilege to an immigrant to live, work and study in other countries on a permanent basis. Although, most advanced nations are still offering the temporary visas to the immigrants in good numbers, however, obtaining the PR visa is not all that easy as it used to say a decade back. The rules and procedures for acquiring permanent residency have become stricter than earlier. Hence, most of the PR visa application either take ages to get approved or get rejected based on one or other reason. So, under such circumstance, there are not many countries which offer you PR quickly and easily. Wait a minute! Do we still have a nation that still offers PR and that too within six months or even earlier? Well, we certainly have one such nation. Also read-How many points required for Canada PR 2018? Canada is one among the very few advanced nations today, which are offering quick PR Visas to the immigrant workers from all part of the worlds without any discrimination. Canada is popularly known as the country of immigrants as its population is a mix of people with different race, religion, colour, identity and ethnicity. It has a multicultural society which is also tolerant and soft on immigrants and their families coming to Canada. The government of Canada has taken many steps in last few years to relax the immigration rules and requirements in the country and allow more and more people to get permanent residency in Canada. It’s a win-win situation for both Canada as host and immigrants as the guests. Canada needs skilled and talented professionals from overseas to meet the skill shortage across its various state and territories. Canada also has a list of occupations in every state for which it needs the highly skilled, trained and talented people from overseas. Launched in January 2015, Express Entry System of Canada is the fastest and most organized point based online immigration system in the world. It is based on a point system called CRS (Comprehensive Ranking System). Express entry evaluates the applicants who register on it and subsequently, allocate them points based on age, education, work Experience, language skills, etc. The IRCC launches draw every fortnight and select the top ranking profiles from the express entry pool. The selected applicants get Invitation to Apply for Canada PR visa. The applicant then submits a complete application for Canada PR and if all verifications are fine, the applicant get the visa approval within six months. 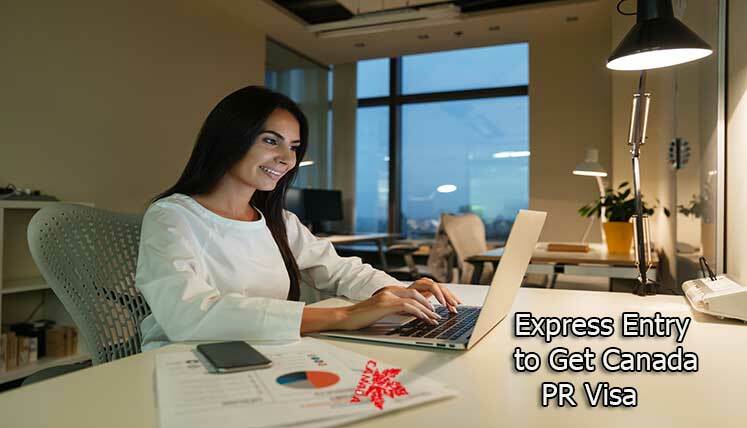 So, if you are interested in applying Canada PR through the express entry, you may you may call Visas Avenue immigration experts to get complete process assistance. You may call the expert on Toll-Free Number- 78-18-000-777. Alternatively, e-mail your queries to Visas Avenue e-mail id- info@visasavenue.com.